Outliner Brush Size 2 Series 840 Mack Brush Series 840 Size 2, Hair Length Out – 1-5/8", Nickel Ferrules. The 840 Series Out-liner is made with synthetic squirrel hair. This is a new synthetic that gives you the benefits of a natural haired brush. It is a soft hair that holds a lot of paint and gives you good snap. 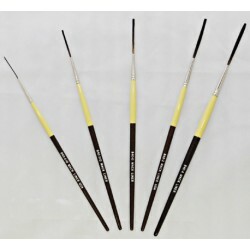 Andrew Mack Brush Co. Out-liner Brush Size 2 Series 840 Lettering and Pinstriping.